Place : Chennai ,Tamil Nadu ,India. 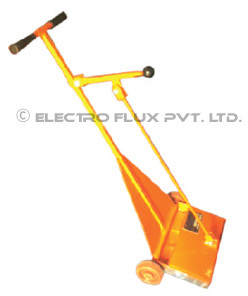 ELECTRO FLUX Magnetic floor sweepers are well built and incredibly strong with powerful magnetism. These sweepers perfect for clearing metal debris from walkways, garages and yards. Reduce the possibility of costly flat tires or personal injury, and decrease the time needed to clean up scattered ferrous metal material. Company Name : ELECTRO FLUX EQUIPMENTS PVT. LTD.
ELECTRO FLUX EQUIPMENTS PVT LTD is the India's leading manufacturer and exporter of Industrial magnetic separation equipments and vibrating equipments used for all process industries like Mineral Beneficiation, Sugar industry, Chemical industry, Pharmaceuticals, Ceramics, Plastics, Abrasives & Food process industries, etc., in various cities like Chennai and more. We value customer satisfaction and adopts customer care policy. Our Quality Policy is understanding the customer’s requirements, designing optimal solutions to meet those requirements, building systems and processes in place to ensure quality at every stage and achieving our commitments, on time delivery and service before and after sales to gain maximum customer satisfaction.